>> New! See the video that proves Gary was there! We arrived about 5:30 pm and had a few beers on the terrace at the Hollywood Bowl. It's a beautiful place. The crowd seemed a bit subduedeveryone still seemed to be surprised to even be there. I was interviewed by a BBC film crew who wanted to know what I thought the show would be like without John. I tried to put it into words but fear I failed miserably. Still, they could tell I was a huge fan so they kept on talking to me. Perhaps I was on TV somewhere. We got to our seats about 6:30-- we were VERY high up. 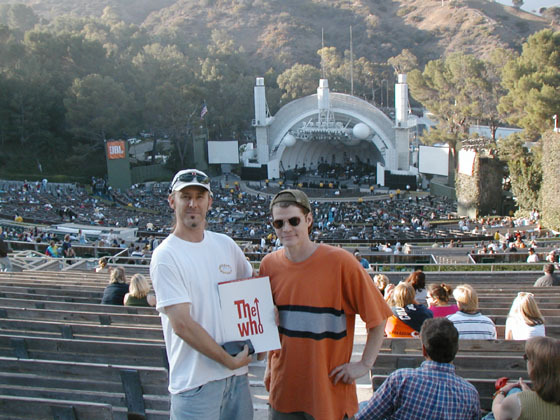 The Hollywood Bowl is absolutely huge-- I've never seen a bigger amphitheatre. Counting Crows' opening set was better that I would have expected, as Adam whatever-his-name appeared truly honored to be opening for The Who. In fact, the notoriously depressed singer was downright giddy. When their set ended, he said, "I saw soundcheck, and it was already the best concert I've ever seen." About 30 minutes later, the video screens showed a film of The Who rehearsing on June 15th. It had been previously posted on Townshend's web site, but seeing it in the theater was very touching. Entwistle's appearance was greeted with roars of approval. After the film ended, the stage went dark for about 15 minutes. Then the lights went down, and out came Pete & Roger. They walked to the center of the stage, hugged each other, waved to the crowd, and ripped into "I Can't Explain," followed by "Substitute" and "Anyway Anyhow Anywhere." The place went nuts. Any doubts about Pino Palladino were immediately eliminated. Pete's brother Simon was also on-stage (playing mostly acoustic), and of course Zak Starkey and Rabbit Bundrick were there too. Zak is a God, if you didn't know. After "Anywhere" ended, Roger addressed the crowd for the first time. He simply said, "Tonight, we play for John Entwistle." And the band tore into "Who Are You." WOW. Even from our nosebleed seats, you could sense the emotion. The next song really fired me up-- "Another Tricky Day." Never heard that one live before. Roger flubbed the last verse, and then explained that it had been 20 years since he had played that song, so give him a break. It was followed by "The Relay," and then Pete finally addressed the crowd. "This is hard," he said (and of course I am paraphrasing here). "We're not pretending that nothing has happened. That side of the stage is missing its usual thunder of noise, but I have t o say that it still sounds pretty damn good to me!" And he was right-- it did. "But this is hard. I just looked down in the front row, and I saw an old friend who had to leave because she couldn't watch any more. But we're doing the best we can, and I think you're getting a good show. I'd call that a bargain." And you know what was next. And then "Baba O' Riley," and "Eminence Front" (Pete forgot the first verse!). Next were a group of tunes from "Quadropohenia"-- "Sea and Sand (very cool! ), "5:15," and the best version of "Love Reign O'er Me" that I've ever heard. Roger sang that song with a passion I've never seen from him. He got a standing ovation. The show continued with "Behind Blue Eyes," "You Better You Bet," and a slowed-down and emotional "The Kids Are Alright." Then came a fierce "My Generation," and yes Pino hit all the notes on the solo bass run to roaring crowd approval. The main set ended with "Won't Get Fooled Again," which mutated into a giant double -speed rave up at the end. It rocked. The encore was an amazing "Tommy" medley. It started with "Pinball Wizard," and then segued into "Amazing Journey," "Sparks," "Underture," and "See Me Feel Me." Everyone sang along. And then it was over. It wasn't quite the show I expected-- there were no new songs, even though they had rehearsed many. I'm sure these tunes will appear as the tour continues. And there were no Entwistle songs either-- not even songs written by John but sung by Roger (like "Trick of the Light" or "Had Enough"). But I have no doubt these songs will appear later as well. Honestly, the show was amazing. Palladino did a superb job, and it was a true celebration of The Who's music. Pete was perhaps more restrained than usual, but Roger was as animated as I've ever seen him. From my perspective, Roger needed this. The word is that Roger left the tour decision up to Pete after John died, and I think Pete knew that Roger needed to be on the road. So here they were, and it felt right. I left the Bowl giddy, as did 20,000 other Who fans. It was exactly what I needed, and it was what the band needed too. Long live rock.